This is the ninth article in a ten-part retrospective of the Harry Potter soundtracks. You may wish to refer to the previous entries in the series for more information. 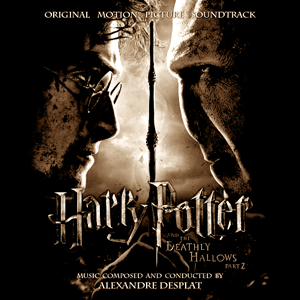 Given that Harry Potter and the Deathly Hallows Part 2 is a direct continuation of the seventh film, and given that it was orchestrated by the same composer, Alexandre Desplat, as its predecessor, and given that we jump right into the story after only a few minutes of info-dump, I figure I can skip all the explanations about who the composer is and what I thought of his previous works both in and out of the Potterverse. If I have a problem with Desplat’s use of consistent themes in the soundtrack, it’s that the themes only slightly tied together with those from the previous. If viewers are supposed to consider the two films a single, four-and-a-half-hour piece of cinematic art, why wouldn’t the themes be more unified. Contrast it with Star Trek II and Star Trek III, with both soundtracks composed by James Horner. II’s main cue, heard during the opening credits, contained sections that became the main cue for III. Moving from DH1 to DH2, the only real cue I recognized off the bat was the quick violin bed used under much of the rest of the soundtrack and first heard in DH1’s “Snape to Malfoy Manor”. “Dragon Flight” — Desplat mixes “Hedwig’s Theme” with “Lily’s Theme” in a nice way here, fading down toward the end after the Golden Trio jumped off the dragon. “Neville” — This track gives us insight into the importance of Neville throughout the film. Because of the way the books had to be cut down, we really missed out on some of Neville’s moments throughout the film series, but Desplat reuses portions of “Ministry of Magic” and “Polyjuice Potion” from the previous film to great effect, giving Neville his own theme that returns in his three major scenes. “In the Chamber of Secrets” — Again Desplat reworks “Hedwig’s Theme”, and appropriately, since we’re in a place from early on in the series. Once the tempo picks up, I kind of lose interest because it gets too wild and annoying, but the parts before that are good. “Neville the Hero” — You see it happening in your mind’s eye as you listen. No composer can ask for anything more. Plus, for a film that hasn’t had a whole lot of happy moments, Desplat pulls out a good triumphant theme. This soundtrack is more about cycles than themes, though — I counted at least three of them. I approve of that style of orchestration — giving the major climactic sequence of the film its own series of specific themes and cues (all of them at least somewhat derivative of the other themes already established in the movie). The first is the Battle Cycle, which begins in “Statues”, using that track and “The Grey Lady” to set themes that are heard again in “Battlefield”, “Courtyard Apocalypse” (one of my favorites on the album), and “Showdown” (which brings in the cues established early in the film before hitting the Battle Cycle themes). It ends with, rather appropriately, “Voldemort’s End”, which, musically, you can kind of tell just by listening to that the hero is about to triumph before it actually happens. If anything, I think the actual death scene was kind of weak, and the composer didn’t have a lot of time or a lot of commensurate action on the screen to really give us the kind of death music Vodlemort deserved. Another highly-anticipated series of scenes has music that I’m calling the Snape Cycle. It begins with “A New Headmaster” — not really a great track per se, but I did like the way he used “Hedwig’s Theme” and some orchestral stylings vaguely reminiscent of the first couple of films to remind us how we felt when we first saw Hogwarts and help to underscore how we feel now, seeing Snape in charge**. We’re reintroduced to it with “Snape’s Demise”, and Snape himself gets “Hedwig’s Theme” as well as “Lily’s Theme” — Desplat tries to foreshadow what’s coming using music, because it certainly wasn’t foreshadowed in any of the earlier films. Then we get “Severus and Lily”, which probably could’ve been called “Snape’s Redemption (for everyone who didn’t figure it out already)”. It’s this film’s “The Deathly Hallows”. Finally, there’s the Harry Cycle — “Harry’s Sacrifice”, “The Resurrection Stone”, and “Harry Surrenders”. These are a little more juvenile-sounding — it’s the bells — but the underlying bass notes let you know that something really bad is about to happen***. There’s also an annoying chorus. Nothing against choral singers, but again… overused. “Harry Surrenders” is a little more like the Battle Cycle, but it fits. If the soundtrack failed anywhere for me, it’s with the final track, “A New Beginning”. It was too light, too airy, and not nearly moody enough to really capture the end of an era. I’m extremely disappointed that we didn’t get something like this at the end of the film. Desplat still uses the “additional instrument playing a fugue or series of accents over the rest of the orchestra” technique that I wasn’t so much a fan of last time around, but I was expecting it this time, and I figured it was worth overlooking because… let’s be honest… this is my second-favorite of the Potter soundtracks after Goblet of Fire. I mean, it’s a big job to be told “your music is going to be associated with the end of what is possibly the biggest film franchise of the past two decades.” The composer pulled out all the stops and gave us an excellent soundtrack which included consistent themes, callbacks to previous soundtracks, and an intriguing use of cycles to move the listener from place to place in the film, making sure that the right mood is kept even if scenes aren’t adjacent. 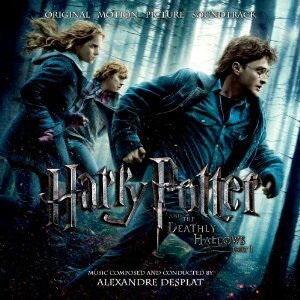 This soundtrack was most definitely a fitting end to the Harry Potter film series. And it’s absolutely worth listening to again. I’ll definitely be keeping my ears open when I see the film next time. * Which isn’t to say that I didn’t notice the music throughout, because I did. But then, I do that sort of thing. ** Okay, seriously? At this point, how could anyone possibly still think Snape was the bad guy? Show of hands? *** And, again, why didn’t Rowling just kill Harry? Imagine how much more powerful that would’ve been! Why the whole King’s Cross BS? WHY?